Begin by cutting stem off to less than one inch and slicing an inch or so off the top. Rinse under cold water and place in a steaming basket situated in a pot holding a few inches of water, garlic clove, bay leaf, and a slice of lemon. Cover, bring to a boil, lower heat, and simmer until outer leaves can be pulled off easily (25-45 minutes). You can also wrap in wax paper and cook on HI in microwave for five minutes. When cool enough to handle, spread the leaves and remove fuzzy choke with a spoon. Serve as an appetizer or side dish with melted butter, mayonnaise, or another dipping sauce. Goes well with a dry chardonnay wine. 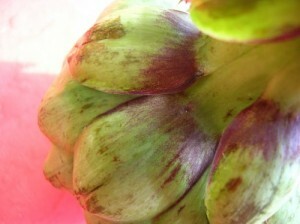 Artichokes are a source of vitamin C and potassium and are said to lower cholesterol.